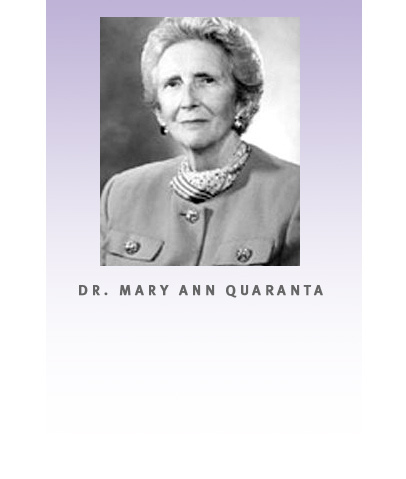 The Dr. Mary Ann Quaranta Award is named in honor of Dr. Mary Ann Quaranta, a passionate advocate for education and leadership her entire life. She is a founder of the Collaborative for Palliative Care in Westchester and the New York State Southern Region. Dr. Quaranta will have a profound and enduring impact on Westchester for generations. Having earned her doctorate in social work at Columbia University, Dr. Quaranta spent her long, accomplishment-filled career at Fordham University, serving as Dean of its Graduate School of Social Service from 1975 to 2000. In 2001, she was appointed Provost of Marymount College in Tarrytown, a women's college. The Rev. Joseph M. McShane, S.J., the President of Fordham University, described her achievements warmly: "Throughout her remarkable career, Dr. Quaranta has been a tireless advocate for the poor, and a perfect citizen of Westchester County and metropolitan New York. The University is proud to claim her as one of its most illustrious and legendary deans." Dr. Quaranta worked closely with the Westchester County Department of Senior Programs and Services in multiple leadership roles. She chaired the Elderboom Conference at Marymount College of Fordham University in 2003 with U.S. Senator Hillary Clinton as the keynote speaker, and was deeply involved in the first SPEAK-UP (Student Participants Embrace Aging Issues of Key Concern) program at the college in 2004 highlighting contributions students made to issues in the aging arena. This program achieved national recognition when it won the 2005 Johnson and Johnson/Rosalyn Carter Leadership Award. Dr. Quaranta also played a leadership role in the Pre-White House Conference on Aging in Westchester leading up to the 5th White House Conference on Aging in 2005. The Elderboom Conference and the Pre-White House Conference on Aging lay the foundation for the building of the grassroots coalition of members that now constitute the Collaborative for Palliative Care. Dr. Quaranta chaired the first meetings of the coalition in its formation. She was instrumental in helping define the consensus of the membership and plan the initial conferences of the Collaborative that were so successful. Dr. Quaranta was the force behind Fordham's establishing a Westchester branch and its Ravazzin Center on Aging. The Ravazzin Center on Aging has been a founding member of the Collaborative and a generous supporter of the work of the Collaborative in both program development and research. The Collaborative is pleased to continue Dr. Quaranta's legacy by recognizing distinguished service to the community in conferring awards in her name. Should you wish to make donations to the Dr. Mary Ann Quaranta Fund, please contact Mary Beth Morrissey at mamorrissey@fordham.edu. Andrew Gold, Executive Director of Global Benefit Planning of Pitney Bowes, Stamford, Ct., and Mae Carpenter, Commissioner of the Westchester County Department of Senior Programs and Services.